On Friday I got back to Occupational Therapy at OT for what turned out to be the last time – This was the final appointment where they show all the awesome disability-appliances, tell me how much easier life would be if I had an electric tin opener or a load of ergonomic pillows or an easy-to-grip pen, then break the news that they can’t prescribe me them, and that I’ll never be able to afford them. The cheapest item is the £5 tap-turner, for crosshead taps, which won’t necessarily fit *all* crosshead taps so you just have to buy it and see. I now have a copy of the OT Stores catalogue, which may be the most depressing item in existence. An awful lot of “Your life is a sad mess, so here’s a load of white, beige and institutional blue stuff which might make it marginally easier to physically get around, whilst also ruining your self-image and making you feel reliant on us”. Because the worst bit about being disabled is the part where you can’t forget it, even on the days when you feel basically all right. There’s a grab rail next to my toilet, for when I can’t stand up on my own, and a flannel in the sink for the days where washing myself otherwise is impossible. Next to my bed, I keep a stack of high-energy food, Lucozade, and empty bottles. Even on days where I’m doing all right, where I race downstairs, make myself a pot of treacley Polish coffee, then go into town, I have to go past the extra hand-rails on everything, the perching stool in the kitchen that lets me cook, and then spend a few minutes debating whether to stick a full set of orthotics in my bag “just in case”, alongside the morphine and the overnight box of medication in case I end up trapped on a friend’s settee overnight. It sounds like a minor whine, but I don’t want my house to look like an old people’s home. I want my decorating – Which I put a lot of thought into – to stand on its own merits. I want people to sit down in the living room and notice the Meiji-era table, the well-worn and comfy Chesterfields, the open fire in its cast-iron surround, the furisode hanging on the wall (Which changes with the seasons) and the bookshelves bending under the weight of a lifetime’s worth of books and scientific equiptment. Not to have to step around a contraption of white metal tubes and blue straps which helps me get in and out of a chair. I want people in my bedroom to feel drawn towards sitting on the bed, curling up in the pillows and sheepskins and blankets heaped up against the headboard of the victorian gothic fantasy that is the frame. I don’t want people in my bedroom to feel as if it’s a holding pen for a cripple, covered in beige “disability adaptions” and that they have to sit on a stool as if they were visiting my bedside in a hospital. I want people in my workshop to sit on the chaise longue, look around at the things that I’ve made, and be impressed, not to fixate on the weird contraptions around my workbench which make it safe for me to use. I accept that I need things to make my house easier for me to live in – That there’s going to be an emergency walking stick in every room, that my bed has tall corner posts so that I can use them to steady myself as I stand up, that I have a mini-kettle so that I don’t need to try lifting a full one, but I resist the idea that all disability adaptions have to be so clearly marked-out as such, with their medical colour scheme, their wipe-clean vinyl padding, and their right-angled, safely-rounded shapes. I want grab rails made of turned cherrywood, support frames laquered black with brocade straps, multi-compartment pill boxes which look like cigar cases. There’s been a pleasant alternative to the “Everything must be beige” meme lately, in that disability appliances have started to be available in “cute” – Pastel-coloured crutches, heat packs in the shape of zebras – but there’s nothing commercially available that’s made to just complement the decoration of a room. The world of orthotics is slightly better than that of home appliances; My splints are mostly plain black, prostheses are getting to the point of both serious functional and aesthetic customisation (for a fee), and wheelchairs are available in almost any colour that you could spray a car in, but there’s still room for improvement. Anyway, this wasn’t even today’s major complaint. 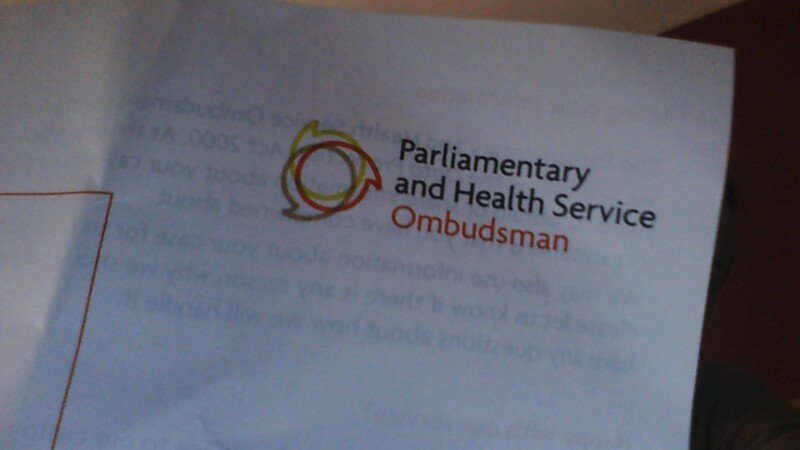 Today’s big whinge was that RL had actually entirely forgotten to make the rheumatology referral for me which I’d been promised on the 22nd of May. I only found this out when I asked at the rheumatology department at CA on Friday, having decided to pop along and see if anyone knew how much longer I’d have to wait before I heard about it. And lo, nobody knew anything about it. Many long phone calls later – Phone calls which, if I’d not known to make, since nobody told me to make them, I’d not have done and thus wouldn’t have got my referral – and RL have promised that they’ll remind Dr F to get it done, and get it done quickly. So basically, I might not get to see my local rheumatology team until after I’ve been down to London, meaning that I won’t be prepared for Dr Kk’s team, and meaning that they won’t have anyone to discharge me back into the care of. All losses-of-privilege are equal, but some are more equal than others. I’ve got into a lot of fights about privilege hierarchies lately, at least partially inspired by a (white) cis male friend who gets bodily flung out of the way on public transport as people rush to the priority seats, because they assume that, being young and male, he’s going to be ablebodied as well (This is basically why he can’t use public transport anymore). This is even though he walks with a stick. He’s got Ehlers-Danlos Syndrome, more dramatically than I do, and as a result a badly-timed knock (or being made to stand on a moving vehicle) can leave him bed-ridden for a few days. I’m only marginally better off, wear wrist, elbow and knee braces all the time, walk with a cane or crutches, and take huge amounts of morphine to deal with the pain which comes with it. And here’s the thing that occurred to me. I’ve been told over and over again, that I’m really near the top of any privilege pyramid that can exist. This, generally speaking, centres around the fact that I’m white and thin. And yep, I really am white and thin. It’ll swap your fat, for my disabled. So you get to be white and thin and disabled, and I get to be white and fat and ablebodied. This is a chance that I’d jump at. I would literally tear your hand off to get that magic lamp, if I could. How about you, White Fat Ablebodied Woman? It’ll be glorious! -You’ll get to wear all the cute clothes! Everything will be made in your size, as-default! -You’ll get to go shopping, in bricks-and-mortar shops, and try things on before you buy them! No more online shopping for you, you can go out with your friends and buy things! -When people meet you, they won’t make any sudden assumptions about your lifestyle! – Of course, you’ll still get snide jokes, but instead of getting called “porky”, you’ll get called “cripple”, and you’ll still get things thrown at you in the street, and violent attacks because you’re wrong/different/an easy target, and people still make assumptions about your lifestyle (We get called lazy too, and get assumed to be stupid, just like you do, and thought of as asexual, and assumed to not care about our appearances, and passed over in job applications because even though it’s not lawful to do so, employers would still rather hire someone that’s not disabled) and every second person has advice about how we could “get better”, but some things never change, and we’ve just swapped one privilege for another, so hey hum, it all tallies out… Right. Oh, and people WILL want to touch your orthotics, or your wheelchair, or your cane. So your personal space kind of won’t be your own, even more so than the standard “You’re a woman, thus your arse is pinchable” way, more like “You’re a cripple, so I’m going to have to touch you and push you and steer you around because you obviously can’t think for yourself, and I need to interact with you as if you were a toddler that’s lost their grip on Mummy’s hand” But you’ll get used to that. Onwards! -Hang on, you won’t get to wear all the cute clothes. You’ve lost your job because you can’t make it into work in the mornings, because your medication makes you feel so ill. So you can’t afford them. But never mind, even if you could afford them, you couldn’t wear them, because you can only fasten buttons and zips half of the time, and your skin hurts so much that wearing clothes at all is like being rubbed all over with sandpaper. Ah well, you’ll settle for the soft cotton t-shirt and the jogging bottoms that you’ve had forever, they’re nice and comfy and they’ll do whilst you go out and buy your tightly-budgetted new wardrobe with your friends! -Wait a minute, you can’t go out! Every time you try to stand up, there’s explosions of pain from one or more of your joints that momentarily blind you. And you’re still knackered from a combination of your medication, the wrestling match that you had last night with your own shoulders, and the fatigue that goes hand-in-hand with chronic pain. Oh well, have some more morphine and get out there, girl! -Hang on, you probably don’t really want to go out there. If you’re going on your own, you’re going to need to really put your faith in the goodness of strangers. And be prepared that if you DO collapse in public, you’re probably going straight to A+E, whether or not a friendly bystander decides to help you get there or not. Might be better off just staying at home, really, unless you can get a friend to go with you. And if you do stay at home, you can’t automatically shop on the internet – A lot of the time, your hands are going to hurt so much that typing is impossible; But don’t worry, you’ll get really proficient with speech-to-text, if you can find a way to afford the software (Damn having lost that job and having to wait for PIP/ESA – Oh, and if you DO want ESA, you’d better not try to make a bit of money on the side; ESA is a commitment to live below the poverty line dontcherknow). But hey, you’ve got good friends, and they LOVE your new look, so one of them has picked you up from your house and off you go to the shops! -Hmm, you’ve gone out with your friends, but they’re kind of diving off ahead of you – They want to go to ALL the cute clothes boutiques, so… I suppose it’s fine, you can wait a few out in a coffee shop. Oh, now your joints are seizing up from sitting still for too long. That might end up with a fall, and back to A+E you go. And it’s looking like your friends are getting on well enough without you – I suppose it is a lot to ask that they always visit your house, especially when half of the time you’re barely conscious and just need them to bring you groceries. They don’t mean to drift away, but I suppose they are, a little bit. But hey, you can make new friends, now that they’re not all going to assume that you’re lazy and gross! – Ah, um… Looks like you’re finding it difficult to meet people at all, what with never leaving the house. Nobody is judging you, but that’s because nobody knows you exist, other than a couple of taxi drivers, your flatmates, and your physiotherapist. But hey, let’s take a trip out to an evening class – They’re a great place to make new friends, you’ll be indoors, with a first-aider, and you can get there by taxi if you’ve budgetted enough to book one (Man, money is tight with no regular income). So you get to the evening class (Not the first one you wanted! The first one you wanted wouldn’t let you go for nebulous “insurance reasons” that they never quite clarified) and you know what, it’s pretty good! You’re sat down, having a bit of a giggle doing a life-drawing and get to meet some new people – Oh, but they want to go out to the pub. Or town. Well, you can’t do that, but you’ll invite them over, when you can. Of course, you have to cancel a few times, because you’re not well enough to host, and you miss a few classes so you never re-schedule, and they start forming friendship groups that don’t really have you in, and you’re back to square one. -But hey, like you kept reminding me over and over again, this body is a massive privilege, and your disadvantage and my disadvantage are exactly equal in magnitude, so you must be feeling just as good about this transaction as I do! Hmm, if you’re not going to take it, I’m going to take this lamp over to British Minority Ethnic Thin Ablebodied Woman and ask her if she’ll swap me for a White. I’ve had a lot of people sound scared or intimidated by the amount of medication that I’m on lately, and who’ve actively shamed me for what I take. People have been sceptical about the good that it does (suggesting acupuncture, homeopathy, aromatherapy, etc instead) and generally insinuating that I’m just being weak in needing to medicate my pain away. Firstly, getting pain under control isn’t just a matter of comfort or preference. Pain causes real, physical damage. Pain causes spasms, which can rip connective tissue, snap bones, crush nerves and blood vessels and result in damage that takes weeks to heal. Pain causes insomnia, which reduces concentration, increases blood pressure and cortisol levels, and results in heart problems and digestive issues. Pain causes nerve damage and long-term chemical changes in the brain, meaning that harmless stimuli like gentle touching or the movement of fabric on skin can be processed as harmful, causing more pain. Pain shortens lives. Pain is bad. Secondly, I coud write a whole post about pain levels and types, and I probably will do that either later today or later this week. Suffice to say, if someone says they’re in pain, just believe them. Apropos of all this, I was taking photos of pills and their packaging for my sister today, since she’s doing an art project involving them, and that’s left me with photos of the packaging that my medication comes in. So I thought I’d use that as a stepping-off point for a post about what I take and why I take it. Yes, it’s blurry. Sorry about that, but it does illustrate pretty well that I have shaky hands at the moment, caused by the damage to my right arm after yesterday’s debacle. Paracetamol 500mg: Two boxes of a hundred pills each. Up to eight a day PRN. The familiar painkiller and anti-inflammatory, available over-the-counter but since I get free prescriptions I get it prescribed. I hate it, it makes me gip when I take it, and it unsettles my stomach. On the other hand, it deals well with opiate-induced headaches really well. I avoid taking it as much as I can. Prescribed by Dr A earlier this year to replace the Naproxen, even though the Naproxen has less side effects and helps more. I’ve obviously kept taking the Naproxen. Naproxen 500mg: Two boxes of twenty-eight pills each. One every morning and one every evening, allegedly with food but usually with a soy shake. A non-steroidal anti-inflammatory, and basically Ibuprofen’s bigger sibling. Slightly less powerful than Diclofenac, but I find that it has very few side effects other than slightly burning the back of my throat if I take non-coated versions of the pills (I prefer the bright yellow Aurobindo ones, for ease-of-swallowing). All NSAIDS have the potential to damage the stomach lining and put stress on the kidneys, but I find that I barely know that I’m taking Naproxen, until I stop. And then I’m really, really sore all over. First prescribed by Dr A, along with Codeine Phosphate, last March (2013), before I was even diagnosed. 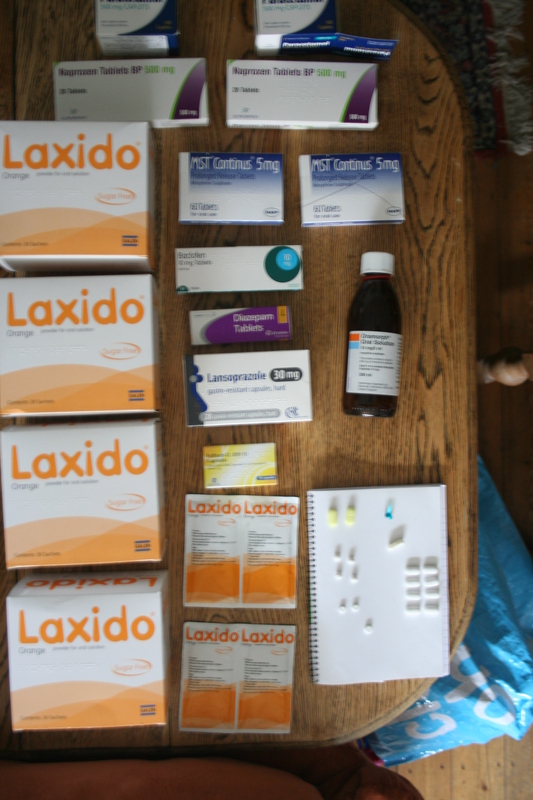 Laxido: Four boxes of thirty sachets each, up to eight sachets a day PRN. I try not to need this more than one a week. Laxido is a laxative which works by binding water to macrogol, a sugar which can’t be absorbed through the gut wall. This results in a lot of water being directed into the intestine, rehydrating the faeces and making it softer and easier to pass. It deals nicely with both constipation and full-on faecal impaction, but it also causes horrible gut cramps and makes me feel like a walrus. It also takes a day or so to work, and then suddenly works really immediately, meaning that after starting a course of it I have to basically stay at home and near a toilet. Mixing eight sachets into a litre and a half of a strongly-flavoured fizzy drink or juice, and then sipping it all day is my preferred method of intake. You really need to take a lot of fluids with it, since it’s a very dehydrating stuff. Prescribed by the very sympathetic Dr D in January, at the walk-in clinic. MST Continus (Morphine Sulphate, slow release) 5mg: Two boxes of 60 tablets each. Two tablets, twice a day. My standard morphine which I always take, which acts as a background painkiller. I’ve not noticed any particular side effects from this, but then again I don’t have a car and thus my reaction speeds are never brought into question in dangerous situations. It does notably numb a lot of sensations though – Papercuts, mouth ulcers, stubbed toes and the like hardly register as pain nowadays. Prescribed by Dr B in January, after I started having skin reactions to either Buprenorphine, or the glue from the Buprenorphine patches. Dose doubled by Dr B last week. Baclofen 10mg; One box of 86 tablets. Between one half and six tablets a day PRN. My new antispasmodic, which I got prescribed yesterday and am just trying today. So far, no ill effects, but no positive effects either, and I took it several hours ago. And I’ve heard horror stories about its prodome and withdrawal. I do feel rather sleepy though, so it could be that. More information to follow. Intended to replace the Diazepam, but currently it looks like I’m going to phone back Dr H and tell her that I don’t like it. Prescribed by Dr H on Tuesday. Oramorph (Morphine Suplhate) 10mg/5ml, 300ml bottle. 10-30mg per dose, up to 4 times a day PRN (Yes, I could really use being given more morphine, so that I’m not having to ration it out at the end of the month). I use Oramorph about two days in three, usually only 10mg per day, going up to around 100mg in crisis, and it is my most reliable go-to painkiller. At 10mg, it gently kills pain, at 20mg, it almost completely removes both the pain and the fear associated with it for up to three hours. I honestly do think that half of the effectiveness of opiates is in their ability to relax and soothe the person taking them – No longer fearing your own pain will go a long way towards making it manageable, and that physical relaxation promotes sleep and good-quality rest, which also help to heal whatever was causing the pain in the first place. It also acts as an antispasmodic (Again, it relaxes the person taking it, meaning that muscles in spasm will often relax out of spasm), allowing dislocated joints to be reset with a minimum of force and trauma. It is also relatively quick-acting – The first effects are noticeable within about five minutes (Hence the mantra central to my crises; “Take this, and count to three hundred.”) and it gradually gets stronger over the period of around the first hour. At the lower doses, if the pain is caught early enough, I’m able to continue working/studying/attending lectures/being out and about, and basically nobody can tell that I’ve taken it. At the highest doses, I’m best off if allowed to curl up in a pile of soft sheepskins and pillows and listen to either gentle classical music or meaningless conversation. At high doses, I’ll also feel quite vulnerable and emotionally receptive, so if someone else is present I might want to either tell them how wonderful they are, or hold their hand. The need for physical contact does dovetail neatly with the fact that being this relaxed is also the best and most efficient time to have anything that hurts or cramps massaged out (safer for me, as there’s less chance of something being pushed into spasm, easier for the person giving the massage since they’re not trying to knead rocks), so a back massage will kill two birds with one stone. The day after a heavy dose of Oramorph, I’m often a little bit languid, a bit light-sensitive, and a bit prone to getting emotional, but that fades pretty quickly, and at least for that day I’m usually not in pain either. Prescribe by Dr A last October (2013), after Tramadol and Codeine Phosphate had failed to get my pain under control. Diazepam 2mg. One box of 28 tablets. 1-2 tablets per day, PRN. I use this as little as I can (I’ve had about six tablets in the past two weeks), since it’s not available on repeat prescription so I can’t guarantee always having more of it. It’s an extremely good antispasmodic, but works in a kind of scatter-gun fashion; I’m not just relaxed, I’m positively fluid, suggestible, and frankly would be an uncontrollable idiot if I had any energy, which thankfully I never have when I’ve taken it. It’s a drug of last resort, at least for me, but it is always extremely effective. I spend the next day or so lying in bed and sleeping heavily, and by time I wake up whatever was in spasm has relaxed. Prescribed by Dr S at an out-call to my house last month. Lansoprazole 30mg. One box of 30 tablets. Once per day. This is a protein pump inhibitor intended to make my stomach lining suffer less from the action of the NSAIDS. Unfortunately, it also makes me violently travel sick, even more so than I usually am. Other than that, I barely know that I’m taking it. Prescribed by Dr A earlier this year, and I really had to fight for it, since she wanted to take my Naproxen off me and not replace it at all. Fultium D3 (Colecalciferol UI 800). One box of 30 tiny blue jellies. Once per day. These are the prettiest pills I have, and are a three-month course intended to increase my Vitamin D levels, since I’m badly deficient. They actually seem to be doing their job really well, since I have more energy now, but we’ll see if that’s all just the placebo effect once I’ve had another blood test taken after the course has finished. Prescribed by Dr F, after having been suggested by Dr S at a call-out to my house. …And that’s the lot. Well, plus Pro Plus most days, Nytol a few times a month, daily multivitamins with iron, calcium supplements and the odd glycerin suppository. It’s not actually all that much. I’ve just realised that I never mentioned anything about the weekend – The EDS group, and my tutorial. The group was actually really refreshing – I felt like the least middle-class person there, in fact like the only person there who was below the poverty line, which made me incredibly uncomfortable (All the stuff about middle-class vs working-class discourse very much holds true), but it was nice to be around other people who understand the nature of the beast and to be in a forum where there’s going to be discussion of EDS-related issues in a sort of structured fashion. Sadly, it’s all arranged via Facebook, so I’m not going to be as much a part of it as I could be, but it’s a start. There was also a bendy there who was at least 65, so I’ve also met my first older bendy, and that was quite a hopeful thing – On the one hand, I’m as ill as her, on the other hand, I know that it’s not guaranteed to be one long downhill slide. Tutorial was also good – My tutor is really impressed with my work so far, and is going to make accommodation for me in the exam. I’m getting the Disabled Student’s Office to visit my house next week, to sort out exam arrangements and things. And I’ve bought a book and soon to get a boardgame about German grammar – I’m actually kind of sad that I’m coming close to the end of my formal German education again; It’s been three more years, after the first three at school many years ago, and I just feel like I’ve barely scratched the surface. I want there to *always* be someone setting me little problems to translate and write and play with. Anyway, my right hand is tearing itself to pieces, so I need to take a break and maybe start on the Baclofen. Wish me luck. Another day, another trip to the walk-in centre. So, yesterday morning my entire right-hand side went into the kind of spasm that turns your hands blue and has doctors looking worried. God bless Dr H- She’s the one that first really helped me with my migraines, and now has shown levels of compassion and resourcefulness close to that of Dr dM with respect to my hypermobility. So I arrive in her office, after two hours in the waiting room (So much for “We’ll fast-track you”. Other patients thought I was an addict going through withdrawal, I was shaking so badly. Thankfully, one of them took it upon herself to bring me water, keep an eye on the appointment board for me, and generally look after me a bit), and basically curl up in the foetal position on the floor and howl. Dr H starts prescribing me something which should start to work in the next couple of days, realises that I can barely understand a word she’s saying, pulls vial of tramadol and a hypodermic out of her desk and sticks it in my arse. Then brings me a pillow to put my head on, and one to grip and worry at, since she’s already noticed that when in pain I bite my hands and wrists, and that’s not doing me any good. She then leaves me in the care of a receptionist for a few minutes, whilst seeing to another patient, then returns and explains the new prescription again. All the while, she’s being extremely reassuring – Trying to massage the spasm out of my hand, telling me that I’m doing really well, assuring me that she knows that “pain and fear” is a bit of an understatement for my condition, and importantly telling me what she’s doing in a way that acknowledges both that I’m not an idiot (And actually quite up to date on my biomedical science) but that I am distinctly not at my best due to a combination of unimaginable pain, stress, and tramadol. I leave, thanking her profusely, and go to the pharmacy, where the head chemist – The one who always sees me and whom I’ve got a good working relationship with – prepares my prescription, guides me off to a side-room where I can curl up on the floor in peace, brings me a glass of water, and checks that someone is indeed going to look after me. I eventually get to the point of wandering about the pharmacy a bit, and run into the fellow patient from the walk-in, and we chat for a bit. I worry about the fact that I’m distinctly not charming when high, but she doesn’t seem to notice. After about ten minutes, my best friend’s Mam comes to pick me up, and takes me over to his house to be fed and looked after until my partner can collect me after work. So I spend the afternoon in the guest room, being looked after by one of the cats, and generally melting into the bed a bit. You play World of Warcraft. You got it at launch, played all of Vanilla, and at the end of Burning Crusade you were not just raid-spec, you were geting server firsts, ruining people’s day in PvP, and the blues were writing about your spec on the official blog. People would be awed when you were standing around in Stormwind, they’d not just ask you for advice but they’d really listen to the response. You’d ride around on your Ahn’Qiraji Battle tank, one-shotting everything in your path, and offering to run people through low-level dungeons because you still loved WoW with all your heart and just enjoyed being in the world. Near the end of BC, your account gets hacked, and all of your items get stolen. You keep playing, but you never quite build up the same quality of raid gear, and you miss a lot of the endgame content. Your friends keep playing with you, but they raid without you and it’s difficult to keep up. By the time Mists comes out, you’re really lagging – You’ve missed Cataclysm, and have no idea how to catch up, and you realise that the problem isn’t just your lack of gear, there’s something wrong with your connection. So you start spending time and money. You upgrade your hardware, reinstall a few times, pay for a faster connection, spend endless hours on the phone to Blizzard, change your operating system, buy a whole new computer… And after you’ve spent years and years and lots of money, you find out that the problem is with your ISP. You can’t change providers (they’re the only one in your area) and they can’t do anything to improve your connection. So you’re stuck there. You can see the programme, launch it, look through your gear and list of mounts, sometimes chat to your friends when they’re online (But can’t go questing with them anymore, so you’re just exchanging whispers) but when you so much as try to complete a simple quest you lag out and crash the game. You can just about walk around the quest hubs, so you can see the quests, but if you try to do them, or if too many people log in, you end up getting signed out. You’ve paid a fortune, dedicated years of your life to getting good at it, and now you can’t even rescue someone from murlocs or go and enjoy the scenery. And you can’t just log out. My speech to text programme is basically saving my life right now, since without it I’d not be able to communicate at all. I spent yesterday in bed, slipping in and out of conciousness (80mg of morphine, 6mg diazepam), incapable of function thanks to the sedating effect of the analgesics and the antispasmodics, but still in pain. Eventually a friend came over and picked me up, relocated my hips and shoulders, then my partner came home and fed me and spent the rest of the night looking after me. Currently watching a programme about mobility scooters, and they’ve just mentioned “palliative care”. A woman in her sixties, saying that it feels wrong that she’s only recieving palliative care, and that that means she’s got nothing to look forward too. Another is in her thrities, more like me, vey depressed by her condition, but desperate to keep trying. I’m recieving palliative care too – the best they can do is keep me comfortable. Getting better is all down to luck, and remembering to do my exercises, and not getting too despondent. There’s an older chap as well, and he basically regains some indepenence by getting his mobility scooter, and that makes me kind of happy- That there IS something that can be done, sometimes. Anyway, tonight (I’d nearly forgotten) is a meeting of the EDS society. If I go, it’ll be my first one. I’m currently a bit terrified to go, but on the other hand, it’ll be good for me. Probably. I don’t really know. I’ll report back, anyway. Tomorrow is my Open University German tutorial as well, 9am at the local polytechnic. My tutor knows that I might not make it, but she’s agreed to send me the handouts and do an online tutorial for me if I can’t. For now, I have homework to do. Just a reply saying “We’ve got your complaint and we’re going to look into it” but it’s a start.